25-Jun-2004 -- We visited this confluence at the last day of our 13-day bike trip over Tien-Shan mountains in Kyrgyzstan. 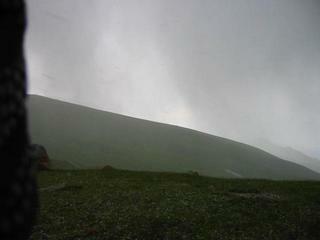 The weather was bad: it was hailing together with very strong wind, so photos are not very spectacular. But in good weather this place should be very nice: there are high mountains on one side and good sight of Issyk-Kul lake on another side. To get to this point one should not repeat all our hard way through ridges and passes. :-) It is much easier to get there from Bokonbaev. Later we will publish our tracks, so you could use them to reach this point.